When my family moved to Florence for a year, I had my new Italian life all planned – long afternoons gazing at masterpieces of Italian art at the famous Uffizi, leisurely evenings at a trattoria, sipping wine. In the mornings, I would work on the memoir I was writing (no distractions like back home!) while my husband taught at NYU’s Florence Campus, and our four-year old, Annelise, attended an Italian preschool. This was going to be so great! Walking with Annelise to school that first morning, the gold Italian light shone softly on the ancient, shuttered buildings. We passed a man in a leather apron standing outside a shoe repair shop, a fragrant panneteria, and a pint-sized piazza that gave the neighborhood a charming small-town feeling. My spirits soared. What a great experience for all of us! At home, I settled down in the breezy, light-filled living room to write. But suddenly noises exploded in the apartment overhead – pounding, crashing, hammering sounds that shook the whole building. It felt like brain surgery without the anesthetic. I hurried downstairs and to find Carlo, the super. One day? I could handle that. Little did I know the noise would never stop. Florence is in a chronic state of pounding, chiseling, pulverizing, and blasting. I remembered my conversations with Susan, NYU’s Florence real estate agent, before we arrived. Susan had lied. Our apartment had 150 mopeds parked outside that sputtered and roared at all hours. Garbage trucks and street-cleaning machines churned away, trucks and buses zoomed past, and the ear-splitting European sirens reminded me of WWII movies about Nazi Germany. Back in the living room after talking to Carlo, I gritted my teeth and jammed earplugs made from toilet paper into my ears. I was going to finish this memoir. But a week later, the noise was starting to get to me. To make matters worse, I was having hot flashes at night. This wasn’t the Florence I’d dreamed of and it wasn’t the self I’d dreamed of either – my new Italian self. I was my same old American self, tired and stressed out, and feeling like a bad mother with no energy for a bouncy four-year old. As for Annelise’s fabulous Italian adventure, all the kids at her school still sucked pacifiers, even the older ones. Annelise had given up her pacifier at three-months; now she spent afternoons wheeling herself around our apartment in her stroller, sucking her binky. The next day, the toilet added to cacophony by making loud gurgling noises. I called Carlo, and soon I heard the plumber’s heavy boots thumping up the stairs. Quickly, I ran to my Italian dictionary and looked up the word for “repeat” so I could explain what was wrong with the toilet. When I told him, the plumber looked startled. I ran and checked my Italian dictionary again. Oh no! I told him the toilet was repenting. The toilet may repent, but I don’t want to be there when it happens. While the plumber was banging around in the bathroom, Annelise appeared, carrying a broom and a dustpan. “Mommy, I swept the balcony all by myself!” she said proudly. “I threw it over the railing,” said Annelise airily. I peered down at the white sheets billowing in the breeze. From the courtyard below, a lady started yelling. At that moment, the plumber burst into an aria, and the telephone and doorbell rang at the same time. I was trapped in the middle of a comic Italian opera. I let Carlo in, and answered the phone. It was Marguerite, wife of the rector of the American Church, whom I had met the week before. “I know a cook who will take you for a ride,” she said, when I picked up. Oh, what the heck, I thought. I’ll go for it. I could use any help at all, even if it meant getting taken to the cleaners by a crooked cook. What Marguerite meant, it turned out, was that the Cooks, a family who lived around the corner, could give us a ride to the American Church on Sunday. In the days that followed, I felt tired and disheartened. I cried when I couldn’t find thread to sew on a button, and sent desperate emails to friends back home. I didn’t need beautiful. I needed help – A surrogate mom, a crooked cook, a robot, anything! A robot –­ that was it! I invented a game where Annelise dialed a special telephone number to order a robot mommy. I would disappear around the corner of the kitchen, and come back, mechanized but cheerful. The game helped me get out of my own skin, at least psychologically, and Annelise loved calling the robot agency. One afternoon when I was feeling especially cranky, Annelise asked to play the robot game. “No, I’m too tired,” I snapped. Suddenly my normally cheerful four-year old burst into noisy howls. Yikes. What had I done to this poor kid? I decided to call a psychologist who, like John, had come to Florence for a semester to teach. I had met her at a party at La Pietra, NYU’s 14th century villa, the night we arrived. Tracy, who also had a four-year old, was probably having a hard time too. We’d commiserate and exchange stories. I’d realize I wasn’t alone, that I was just a regular mom, with universal mom-type problems. I dialed her number and asked sympathetically how she was doing. Great. Alexia was visiting the Duomo and making stained glass windows while my kid wheeled herself around the apartment in her stroller sucking a pacifier. Now I really felt like a great mom. 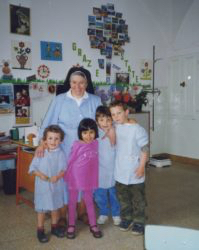 attended a preschool taught by a mischievous, fun-loving nun. 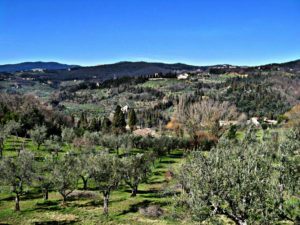 And I discovered that the best writing I did in Italy was while walking; the journal I dictated on my portable recorder had a lilting, rolling gait, and the pictures of rural life I glimpsed on my walks in the hills were like paintings. But it would be a long time before I realized that, in spite of my steely determination finish my memoir and shut out the rest of the world that year, what I was really writing about was Florence, and being a mom when you’re too tired to do it, about hard times and new adventures, and of course what I knew all along – that no one feels sorry for you when you’re living in Tuscany.